Soulful and slightly damaged by her combat experiences, Melinda is an ace pilot, a weapons expert and a soldier who can – and has – gone beyond the call of duty… In the original casting call, Agent May was listed as Agent Althea Rice, aka The Calvary. No point jumping to conclusions – this might be a PR flack writing a press release and making assumptions, for a start. But it’s a curious change nonetheless. File it away for now. Posted by morgue on Saturday, May 11, 2013, at 1:55 pm. Filed under Uncategorized. Follow any responses to this post with its comments RSS feed. Both comments and trackbacks are currently closed. I haven’t given up on the show entirely, but what I’ve seen so far isn’t filling me with confidence. Why no Agent Sitwell? Finally saw Thor last night, and Gorillamydreams is getting rather good at picking up the threads seeded in these movies now (we’ve already seen Avengers). 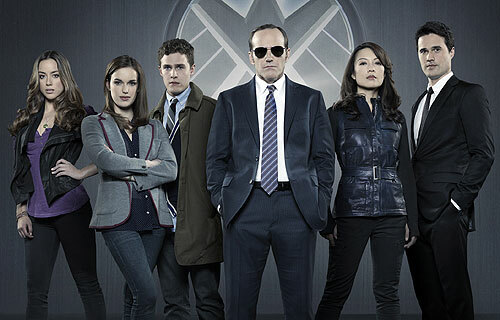 As cool as Coulson is, I dunno about the set-up for this series either. Take away the title and the character bios and we could be looking at another CIS/SVU/Criminal Minds set-up, couldn’t we? Mind you… Whedon. Might make the difference. And does the Bio writer really mean ‘Calvary’ or ‘Cavalry’? Bceause the quiet, slightly damaged person appearing out of frame at the 11th minute to shoot the baddie in the back just as he’s about to clock the hero seems like the person you’d name The Cavalry, yes? Ha! I hadn’t even noticed that about Cavalry/Calvary! It was definitely misspelled that way in the original documents. Or is Whedon doing some very-on-the-nose Christ allegory thing with Agent Coulson? Why do I read those bios and think, Whedon does Torchwood? Still on the same character – hmm… Whedon + femme with crazy weapons skillz + quiet, damaged type = haven’t I already seen this character in Firefly? But as I said, I’m quite prepared to be proved wrong! Heh, I somehow read “Calvary” as meaning she was from Canada. 🙂 🙂 Layer upon layer of comedy misreading? Just saw the trailer, pretty sure Ward is going to annoy me. He seems superfluous. And, um… it’s a very *white* group, isn’t it? Ummm of course it is possible that Ming-Na Wen actually has some martial arts or dance skills that they decided to utilise for the show? Yup, someone else checked out that possibility over on the Facebooks – no evidence that she could find that this is the case. But it might be. Having seen the full trailer which has a badass Melinda May takedown, my current theory is that she’s just a straight up close combat beast like she woulda been regardless of ethnicity, and whoever wrote that blurb just chose a phrase that calls to mind the stereotype of “Asian martial arts expert”.